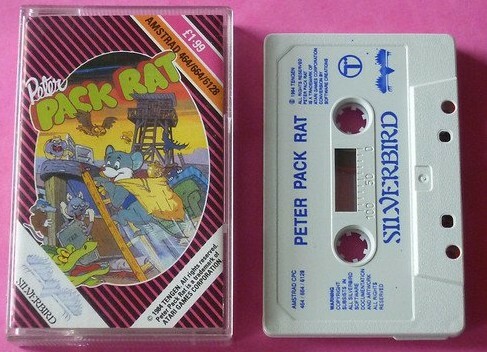 JUST before Britain's sewers crumble to brick dust, Peter Packrat makes his presence felt. This "cute little rodent" lives in a junk yard - quite a comedown from an Atari arcade machine. Anyway, you control Peter using keyboard or joystick. You have to guide him round the junk yard and the adjoining sewers, pick up any loose bits and pieces such as gold bars lin a junk yard?) and take them back to his den, a decrepit wooden hut perched between a couple of telegraph poles. As usual, nasty things are trying to stop Peter completing his task; they include everything from winged books, bumble bees and spiders to Riff Rat, the villain of the piece. One touch from him is fatal. The sewers contain sludge; if Peter falls in, he is immersed up to his neck and can move only very slowly. There is a great variety of movements. Peter can stoop to negotiate ledges or enter pipes, he can slide down inclined planks, be catapulted through the air by a springboard, clamber through the spider's web, climb ladders and steps - he can even do a tightrope walk across telephone wires and jump impossible distances. To keep the nasties at bay, he fires missiles. Accurate shots paralyse and give extra points. Platforms and Ladders, you may say. Originality is not Peter Packrat's strong point. The playing area is rather small and the graphics, which are two colours in Mode 1 and look suspiciously like a direct port from the Spectrum, are not up to Silver-bird standard. The animation is OK though, with lots of frames for the main characters. A reasonable tune plays throughout, but it's very short -about 30 seconds - and repetitive. It tends to slow down slightly whenever lots of characters appear on the screen, and it can't be switched off. Groan. There is a high score table. You are asked for three initials and have to select them laboriously with the joystick rather than just typing them. Green screen users will have great difficulty seeing this, but the game itself is perfectly clear. The strangest feature is the question you are asked out of the blue on loading: "Scroll between screens? (Y/N)". If you press Y the action scrolls smoothly from screen to screen. If you press N it flicks between them almost instantaneously, speeding the gameplay up slightly. Small playing area, tired scenario, ugly graphics, yet inexplicably addictive. Could have something to do with the price.